What is your minimum viable product? How can it help you? A testimonial. When building a minimum viable product speed matters. If you want to read more about Minimum Viable Products and why you should build one quickly, you can do that here. The following article details the MVP journey of one of our earliest clients: Wirelens. The story of Wirelens is a good example of how a Minimum Viable Product can go a long way. In 2014 two economics graduates came to Sentineo for help. They had an idea for an Internet Of Things (IoT) application, yet lacked the technological skills to build it. Sentineo, a one-stop shop for custom electronics design, was the perfect fit. Our clients had conceptualized a smart pocket-sized camera attachable to any surface. Through use of Bluetooth (or WiFi) they wanted to pair their nifty camera with smart devices. Users could control a camera in location A, from their own smart device in location B, all done wirelessly. With access to an external camera, amateur photographers could use a variety of angles to take pictures from. 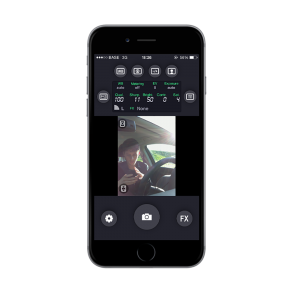 A feature previously limited with hand-held smartphone photograpy. To achieve mainstream success, the camera had to be very easy to use. Smartphone users want to receive pictures directly on their smartphone, without having to use a hardware cable for transferring images. The camera also needed to be small enough so people could carry it around as a gadget. Lastly, it had to come equipped with some sort of re-usable adhesive tape, so that it could stick to a variety of surfaces. 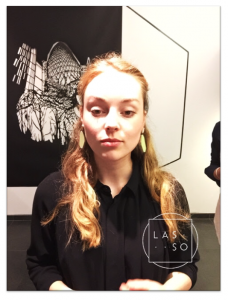 A crucial requirement allowing users to create a portable photobooth just about anywhere. The camera would be positioned as a consumer gadget in a B2C market, building on the premise that consumers wanted to buy smart cameras as an accessory to their smartphones. A dedicated camera was coupled to the board and the necessary WiFi hardware was added. Next to this, specific power management chips were added on the board to extend battery life. The board basically acted as a webserver, connectable via smartphone/tablet/computer. Remotely, photos could be taken and saved on the server side and client side. Within a few weeks we had both prototypes up and running. With the prototypes as a proof-of-concept, our clients started pitching their idea to investors, start-up incubators and anyone that would listen. Their mission statement boldly read “revolutionizing smartphone photography through wireless technology“. 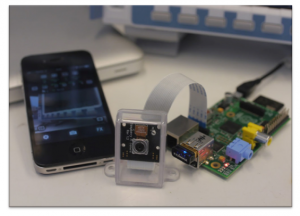 The nifty camera idea made tangible with the prototypes proved good enough to attract a pre-seed investment in the form of a small government grant. 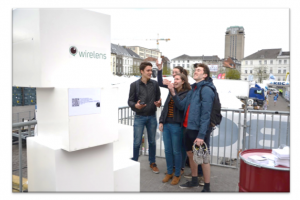 Our clients incorporated and a started a small start-up named Wirelens (Wireless + lens). Their goal? To test the product as soon as possible on a larger scale in a variety of settings. 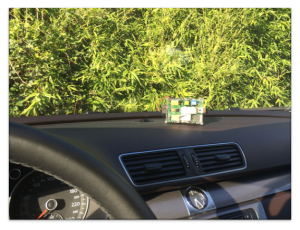 The prototype placed on the dasbboard of a car creating an on-the-spot photobooth. The picture is immediately visible on the smartphone. The portable set-up can be used almost anywhere as the camera is attachable to a variety of surfaces. This competitive evolution, barring possibilities for the mass production and distribution of a consumer-oriented hardware product, compelled Wirelens to pivot into the B2B market place, in which they felt they could better optimize their chances of start-up success. It struck the Wirelens team that GoPro focussed exclusively on a 1-to-1 relationship between one mobile device and its accompanying GoPro camera. In every case it had to be your own GoPro camera and your own smartphone, to allow for device pairing. Feeding on the experience Wirelens had with their own 1-to-1 experiments, they envisioned a set-up where multiple smart devices could connect to one camera simultaneously. 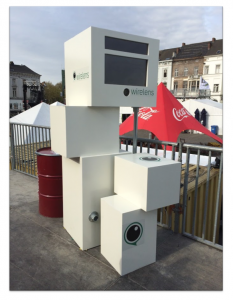 Wirelens pivoted and started setting up cameras in fixed places, enabling wireless connections from multiple smart devices. These fixed cameras, positioned as permanent units in one place, allowed users take photos in group without excluding the photographer. As with most pivoting manoeuvers, the search for the right product/market fit was back on. Most of the learning was done by experimenting the lean startup way. In what follows you can read a brief description of these experiments. The first idea for the wireless cameras was to put them in existing ecosystems. Think of events, festivals, and conventions. 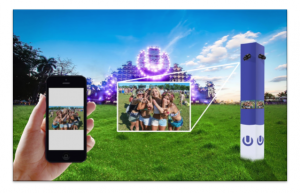 The commercial organizations running these events could then use the camera set-ups as an entertaining gimmick to run marketing campaigns, brand pictures with their logo, and have consumer created content circulating on social media. Mock-up of Wirelens on a festival where digital natives were most likely to act as early adaptors. Experiment 1: A fixed set-up on a small festival, a student relay race, where teams divided per faculty compete for the most laps completed in a timespan of 12 hours. 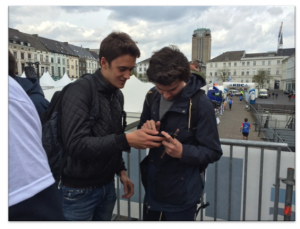 Students could control the camera from the app of the event. These branded pictures could then be shared on social media. 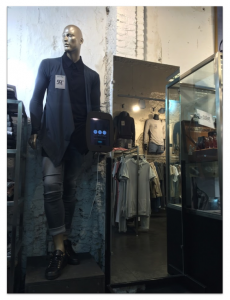 With the help from Sentineo, Wirelens also explored deploying the technology in a retail setting for assisting with purchase decisions. 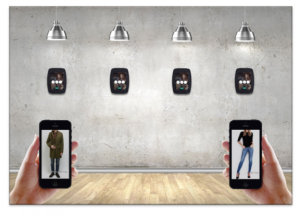 Mock-up of the same technology being applied to remotely controlling built-in tablet cameras, as a smart wireless mirror in clothing stores. 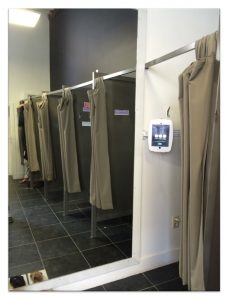 Customers could receive feedback on how clothes fit taking pictures from various angles. Clothing proved interesting, however it was a very fast-moving consumer environment. Wirelens went on to test “slower” high-value purchase decisions that could also benefit from visual feedback, such as jewelry. 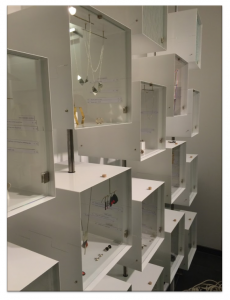 Handmade jewelry could be tried on in proximity of the Wirelens smart mirror. The built-in camera could be controlled wirelessly or from the tablet. Quick comparison between different types of jewelry were made easy with the smart mirror. 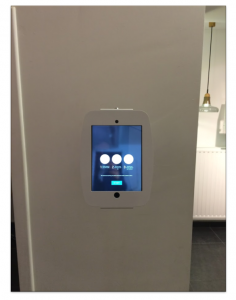 These “try-out” images were then branded with the store logo. 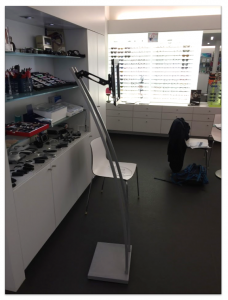 Finally, Wirelens gained a foothold in the opticians market. A market with a slow buyers decision that needed visual feedback for aesthetic reasons. They continued using built-in cameras in tablets leveraging the ease of use. During this whole pivoting proces Sentineo remained in close contact with Wirelens guaranteeing technical flexibility and providing business advice. 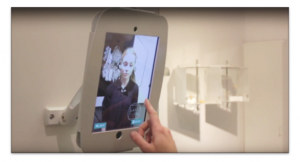 With Wirelens customers could receive visual feedback and compare frames in-store, reducing sales cycles by 20-40%. 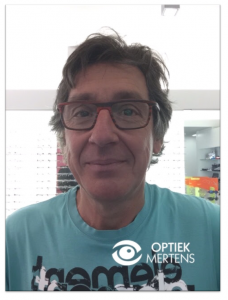 Several optician stores became paying clients for the minimum viable product. Sentineo is a one-stop shop for custom electronics design. Our team of dedicated engineers with diverse backgrounds in electrical engineering will help you achieve results quickly. All right reserved to Sentineo.